Use a nice, big baking potato. Here in the US, I like to use Idaho baking potatoes when I can get them. Baking potatoes bake up lighter and fluffier inside and can withstand the higher baking temperatures in this recipe. And the bigger the potato, the bigger and more beautiful your roasted potato wedges will be so its worth it to pick the biggest you can find. Whether you peel your potatoes or not is completely up to you. I love a good baked potato skin myself but in this dish I prefer to peel. 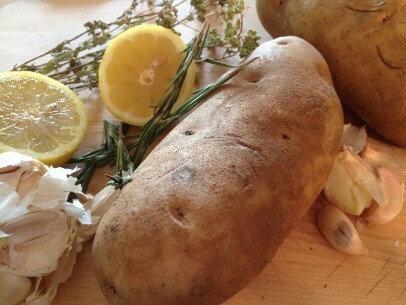 I’ve found that peeling really allows the potatoes to soak up all the delicious lemony, rosemary, oil flavors without the skins getting in the way. The marinade is key to this recipe so make sure you use good, quality ingredients. Fresh rosemary, good olive oil, real Greek oregano and fresh, juicy lemons will give you the most flavorful potatoes possible. And the garlic adds so much flavor to the recipe but some people leave it out because it can burn at high temps. Don’t be afraid of burning your garlic, just make sure all garlic pieces are mixed into your marinade before adding to the baking pan. When the garlic pieces are well-coated they won’t burn and, huge bonus, the flavors melt right into the marinade and get soaked up into the potatoes. IMPORTANT: I’ve found that its better to add the crushed Greek oregano AFTER your potatoes are out of the oven. This is because the oregano tends to burn quickly at the high temps used in this recipe. The rosemary holds up fine in the oven but when oregano burns its leaves behind a very bitter, acrid taste so my recommendation is to add it after potatoes are cooked. The hot potatoes will allow the oregano oils to come out of the crushed leaves and you’ll get all the wonderful oregano flavor, I promise! And remember, these potatoes are fantastic to take the next day for lunch. If you have any leftovers, which you very well may not!, keep them covered in the fridge and either serve at room temp or wrap in aluminum foil and reheat in a 350 degree oven for about 15 minutes. Do not microwave! 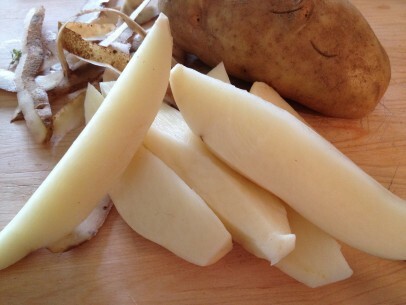 Peel potato and cut into 6 long wedges, set aside. 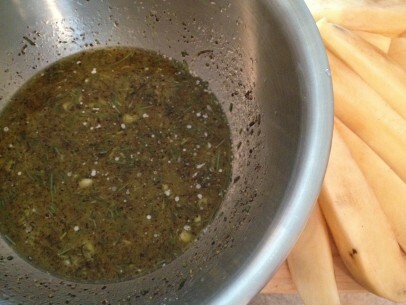 Whisk chopped rosemary, chopped garlic, salt/pepper, olive oil, lemon juice and water/broth together in medium bowl. Add peeled potato wedges to marinade and coat them completely. Transfer coated potatoes and marinade to roasting pan. Roast potatoes in 400 degree oven for 50-60 minutes until fork tender and golden brown. Serve warm from the oven and garnish with additional chopped rosemary and crushed Greek oregano and a wedge of lemon. 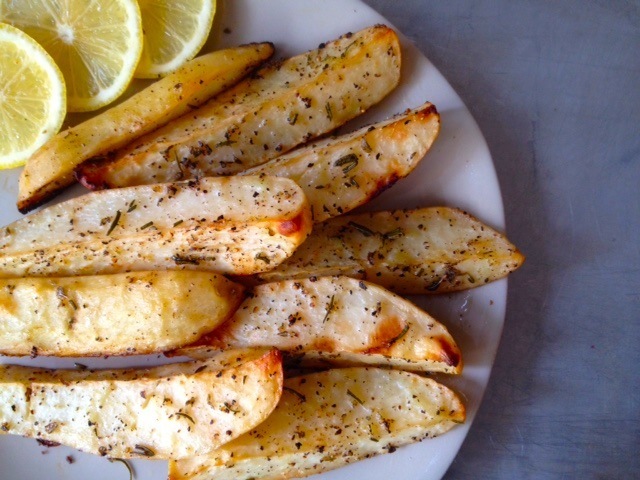 This recipe gives you approximately 12 good sized potato wedges. If you’re serving these as a side to your main meal, the recipe gives you 4 good sized side servings with 3 wedges per person. I usually serve them on a platter as part of a larger table of dishes. So happy to find this site. The foods remind me of the foods my mother made. Thank you!!! Can you marinate the potatoes a few hours ahead of time? I was thinking of putting the potatoes and marinade in zip lock bags; less prep later on! Or would marinating then make the potatoes have top strong of a flavor? I am a Greek Cypriot. The best roasted potatoes ever. Dry rosemary is fine but, fresh rosemary is even better. Instead of garlic, I use thinly sliced onion and add some chopped tomatoes. Heavenly! This was a really great recipe. My whole house smelled amazing. I might use a little less pepper next time, but wow those potatoes disappeared very quickly. Delicious! OMG, these were delicious. Hands down, the best potato recipe I have ever tried, and I cook with potatoes a lot, almost every day. I didn’t have any rosemary on hand, but otherwise I followed the recipe exactly as written. These potatoes are simply the best ever! I’m a Greek wannabe, born into a small American town where roasted potatoes were common. It wasn’t until I had lemon roasted potatoes in a small family restaurant in a small village on Crete that I realized what a truly amazing roasted potato tastes like. This recipe takes me back to the little slices of heaven I found there. Thank you so much! I also sliced a lemon very, very thin and lined the edges of the pan – turned out to be a nice, tasty addition that only enhanced the delectable potatoes. I don’t put the oil in the marinade, I mix it in just before baking. I’ve discovered that the potatoes absorb more of the flavors this way. These potatoes came out absolutely divine!!! Thank you for sharing all of these delicious recipes Kiki!